Update your rooms from wall to wall. At our flooring store, we carry a wide variety of laminate flooring products in many colors and styles. These floors truly cater to anyone’s preference. Whether you want laminate that looks like hardwood, natural stone, or ceramic tile, you’ll find it at our flooring showroom. Adding laminate wood or tile flooring to one or more rooms in your home is a great way to increase your home’s property value and bring your rooms into the 21st century with updated styles and textures. Our laminate collections smartly balance durability, good looks, and value pricing, which allows you to expand your decorating ideas without increasing your budget or sacrificing quality. If you are growing weary of your worn-out floors, give your feet something new to stand on. With so many options in stock, we are certain to carry the perfect product to suit your needs. Since we are part of a nationwide flooring conglomerate, we have access to numerous laminate styles. With our collective buying power, we are able to save on our products so we can pass those savings along to our customers. For family members who suffer from allergies, asthma, or other respiratory issues, laminate floors are an excellent choice. They are hypoallergenic, repel dirt and dust, and their surfaces don’t trap pollen and dander. Adding these floors is a great way to improve your family’s environmental allergies and cut down on the amount of dust and dirt in your home. Go casual, yet classy with laminate wood flooring. Whether you want a classic hickory grain pattern, hand-scraped details, or a contemporary appearance, laminate wood floors are quite versatile. Long-lasting, appealing, and affordable, these floors are the ideal choices for many home and business owners. In addition, our floors are durable and backed by an impressive warranty against wear, fading, stains, or defects. With our Confidence Plus Guarantee, you’re able to purchase and schedule installation for your new flooring with complete confidence that you’ll be thrilled. If you’re not happy with the installation for any reason within 30 days, we’ll replace it. Laminate wood floors are a popular choice for homeowners who love the look of hardwood floors, but prefer the easy maintenance and lower price of laminates. Unlike natural wood, you never have to use hard-to-find wood polishing chemicals to maintain your floor’s gorgeous appearance. Maintaining these floors is as easy as promptly sweeping up dust and dirt and periodically mopping with an approved cleaning solution. With laminate wood, you’re able to enjoy any style or species of wood without the hefty purchase and installation investment. When you shop at our store for laminate tile flooring, you can expect free estimates, easy financing plans, and special offers. At this time, we are offering a special discount when you purchase at our store: $100 off your laminate flooring product! In addition, we never compromise on quality. 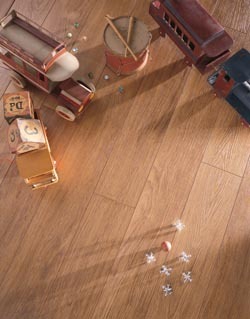 We carry the most recognized flooring brands in the industry, such as Star Values and Floorcraft. You simply cannot go wrong when you choose laminate tile. For instance, if you’d like the appearance of ceramic tile but the durability of laminate, we have the solution. Due to the innovative manufacturing process, laminate is made to appear like actual stone, ceramic, or porcelain tile. However, it is incredibly durable. That is, it doesn’t break; it resists scratches; and it’s not susceptible to moisture damage. In addition, laminate tile flooring cuts down on the chances of water damage to your subfloor. Because laminate tile doesn’t crack or allow water to penetrate it, the only place for water to penetrate to the subfloor is at the seams. With proper sealing and installation by our team, even the seams are protected against water. Provide the best look and protection for your home by choosing this stylish and versatile flooring. Enjoy the look of stone, wood, or ceramic floors. Today’s laminates are innovative flooring products that are manufactured to imitate real wood, tile, and other flooring materials using 3D printing technology. They improve the ambiance of any space while appealing to your sense of style. By installing this type of floor, you effectively create an authentic impression that will not be ignored. Many people choose laminate floors with printed images of natural materials because of their lower maintenance requirements as well as their lower price point. Unlike many types of natural flooring materials, laminate is easy to care for with regular sweeping and mopping with a mild detergent. It is water-resistant, stain-resistant, and able to withstand plenty of traffic and activity while looking like virtually any material you desire. Whatever flooring product you want, you’ll find at our flooring store. We carry laminate and other flooring products that cater to your needs. If you require any help selecting the right floor, one of our trained sales associates will gladly assist you. Install your floor the right way by depending on experienced laminate flooring installation specialists. Doing so guarantees that your floor will last for many years. From removing your old flooring and prepping the surfaces to installing your new floors, we perform flawless services. Having installed laminate floors for many years, the flooring installation specialists we use know the correct and most efficient ways to ensure a job well done. We strongly recommend not going to an amateur, because they may not have the experience or equipment to properly handle the flooring products we carry. Many things can go wrong during amateur installation—from improperly preparing the subfloor to laying the laminate crooked or with odd bulges. For long-lasting, attractive laminate floors, it’s best to get installation by our experienced professionals. Utilizing our laminate flooring installation services is especially important because many manufacturers’ warranties only cover replacement or repair if your flooring was installed by a qualified professional. By allowing us to install your floors, you have the benefit of properly installed flooring backed by our warranty as well as the knowledge that should anything happen in the future, you’re more likely to be covered by the manufacturer’s warranty. Contact us for assistance in selecting a laminate floor product that is right for your project. We proudly serve customers in Carroll, Denison, Jefferson, Harlan, and Lake View, Iowa, as well as the surrounding areas.